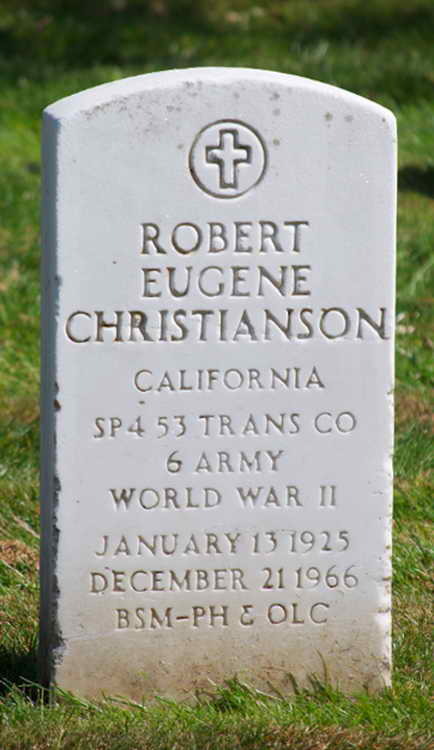 Grave marker for Robert E. Christianson in Section 2C, Site 150, Golden Gate National Cemetery, San Bruno (San Mateo county), California. Robert registered for the draft ca. 1943 and entered service on 9 February 1943 at San Francisco, CA. On 30 July 1943, Pvt Christianson was transferred from The Parachute School, Fort Benning, GA to Company D, 508th PIR. Robert was transferred on Special Duty with the Casual Company, 508th at Camp Mackall, NC on 17 August 1943. Pvt Christianson was transferred to the 541st PIR on 27 November 1943. It appears that Robert remained in the army as he married Margaretha Maria Funk in Vienna, Austria as on 4 March 1955. 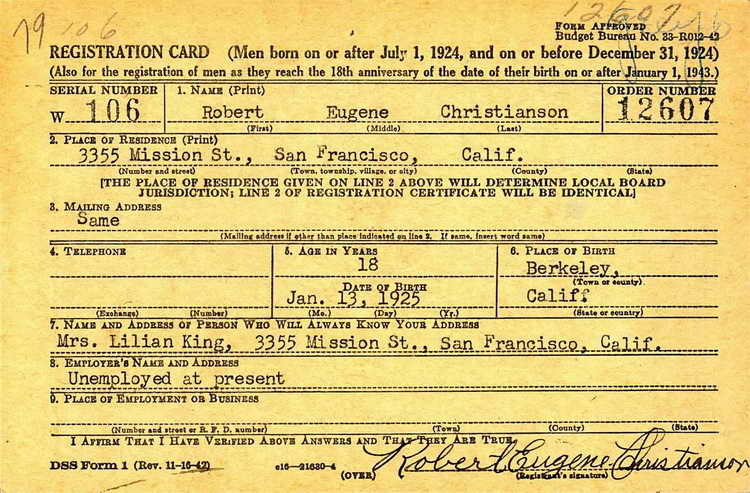 Subsequent naturalization and travel records for her reference travel by aircraft owned, or chartered by, the U.S. Army. His date of discharge is unknown. Based on the grave marker inscription, he attained the rank of Specialist 4th Class and was twice wounded in combat. The reference to a Bronze Star Medal award must have been made during his time of service as the general award to WWII CIB holders was not made available until at least ten years after his death.